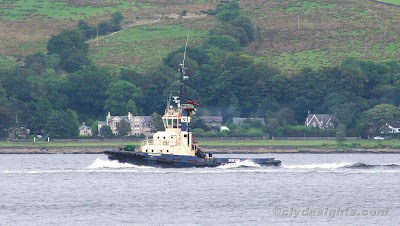 While SVITZER MALLAIG is employed elsewhere in the Svitzer fleet, she has been replaced by ANGLEGARTH, more usually found at Milford Haven. She was built by Damen in Holland and was completed in 1996. ANGLEGARTH, which is 32.72 metres overall, is powered by 2 Stork main engines delivering a bollard pull of 66 tonnes ahead. Twin Aquamaster units give her a free-running speed of 13.5 knots.